It’s probably not really an epiphany at all. An epiphany is a sudden realising of a truth, a revelation. What I’m about to describe is probably a slow acceptance of the bleeding obvious, but well, with the next tour date looming on the horizon it prompted the thought process – so now you have to put up with it, ha ha! In another part of my life I’m a pretty avid football fan – I support Nottingham Forest for my sins – and have a season ticket. 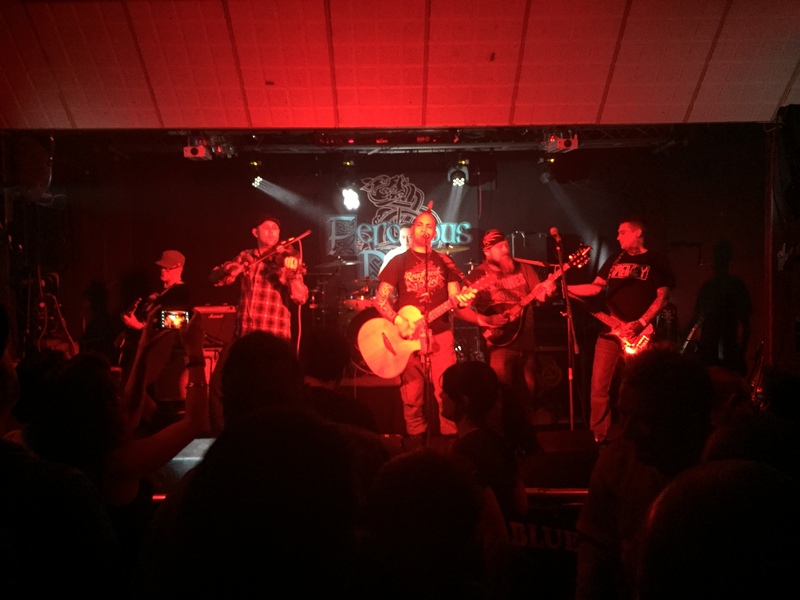 A few times in the last few years Ferocious Dog has come into conflict with this other life passion of mine. This passion is one I don’t regret – it’s if nothing else a chance to spend time with my brother and a number of my closest friends – many of whom I met through this shared interest. Of course, it also allows me to fund millionnaire footballers which sits less easily in the justification stakes! Freeborn John your vision lingers on.. I don’t know if it’s just me that often researches subject matter of songs – the last Levellers album has resulted in me gathering books about the Raft of the Medusa and the Étaples mutiny to learn more about the inspiration for songs on the album, indeed, 3 Daft Monkeys‘ Days of the Dance too added to my library to learn more about the dancing plague of Strasbourg. With Freeborn John, my favourite Ferocious Dog song, I didn’t need to read up retrospectively because I’m already a bit of a geek for the subject of it – John Lilburne. 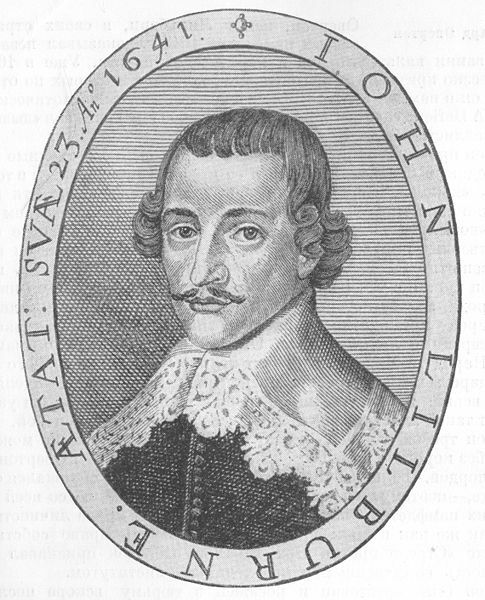 If you want an in depth book to read on the subject then I’d recommend ‘Free-Born John – The Biography of John Lilburne’ by Pauline Gregg, and also checking out The John Lilburne Research Institute. Dan let slip on Facebook yesterday that the second album will be completed in recording terms at the end of this week – and that the name of it will be ‘From Without’. He might’ve mentioned that before to be fair, but he encouraged folk to have a hunt on Google to try to find the reference it might be inspired by. So I’ve been doing just that to pass the time – whether I’ve landed on the inspiration for the name or not remains to be seen! Also, if you haven’t already then get it pre-ordered by Saturday as it will then come signed by the whole band. In the context of without meaning ‘on the outside’ it’s listed as archaic – so whilst you might be without something, to be – for example – opening a door from without seems a charmingly antiquated way of phrasing compared to opening a door from within. Could it be as simple as that? A traditional way of describing themselves as being from the outside? It sort of fits, no record label, self-releasing, shunning many of the trappings of the modern music industry. Do you believe in the power of rock and roll? A slight diversion from the main subject matter of this blog, but a worthy one I think – firstly for the cause tonight was raising funds for. The Sophie Lancaster Foundation was set up to create respect and address abuse and intolerance against alternative subcultures – in memory of Sophie who was murdered in 2007 after a disgusting attack on her and her partner Rob. A hugely worthy cause so hopefully everyone there bought themselves a wristband. Secondly it was being hosted at Foremans, a deliciously non-conformist carbuncle gleefully retaining its punk rock roots whilst being increasingly surrounded by bland corporate chains like Revolution or Slug and Lettuce in the centre of Nottingham, overshadowed by the bleak Cornerhouse eyesore. With a capacity of 55 people you’re guaranteed an intimate gig venue with some awesome people. Thirdly the act was Goldblade – a lure in itself, but one I was intrigued to see in an acoustic setting. After a bit of an enforced break from ‘dogging’ it was back into action yesterday, hitting the road for I think my furthest flung Ferocious Dog gig in Harlow, Essex. With the threat of the M25 around rush hour I allowed plenty of time for the drive and predictably hit no traffic at all, arriving at the venue and parking up with an hour and a half to spare before opening. Oops! Dan and Leanne arrived moments later, the rest of the band were already in situ. Luckily The Square has a bar area that was open so it was there I headed and earwigged the sound-checking as more folk began to arrive. 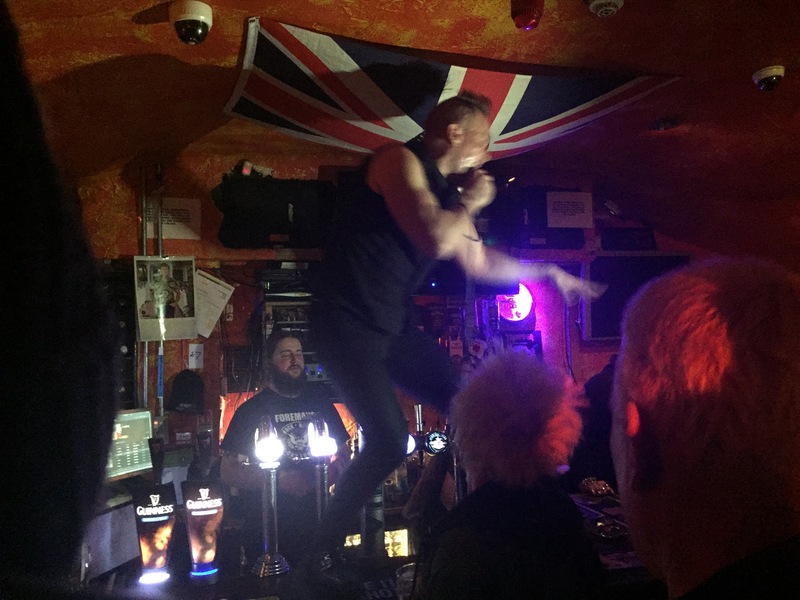 After getting armbanded up and heading upstairs the gig venue was pretty compact – wide with a shallow dance floor with a worryingly nearby staircase you could end up getting launched down – luckily the mosh pit wasn’t too expansive so that never proved to be too much of a risk! New album nearing completion – what splendour! A typically teasing Dan post in the Ferocious Dog Facebook group today revealed that Les has been in the studio today finishing off his guitar pieces for the forthcoming album, with Dan and Ellis due in this week to finish off followed by Ken next week along with an orchestra (!). This of course implies that John and Scott are one-take wonders. A suitably exciting way to build up to the live action restarting this Friday at The Square in Harlow. I’m looking forward to hitting the road to Essex for the next instalment of the tour – just another week of work to get out the way first! In other news the band have confirmed they’re appearing at Nottingham’s Splendour festival this year – teeing up The Twang and Bananarama on the Confetti Stage meaning that they’ll be finished in time to check out James and The Specials on the Main Stage which – no disrespect to The Twang or Bananarama – works well for me! 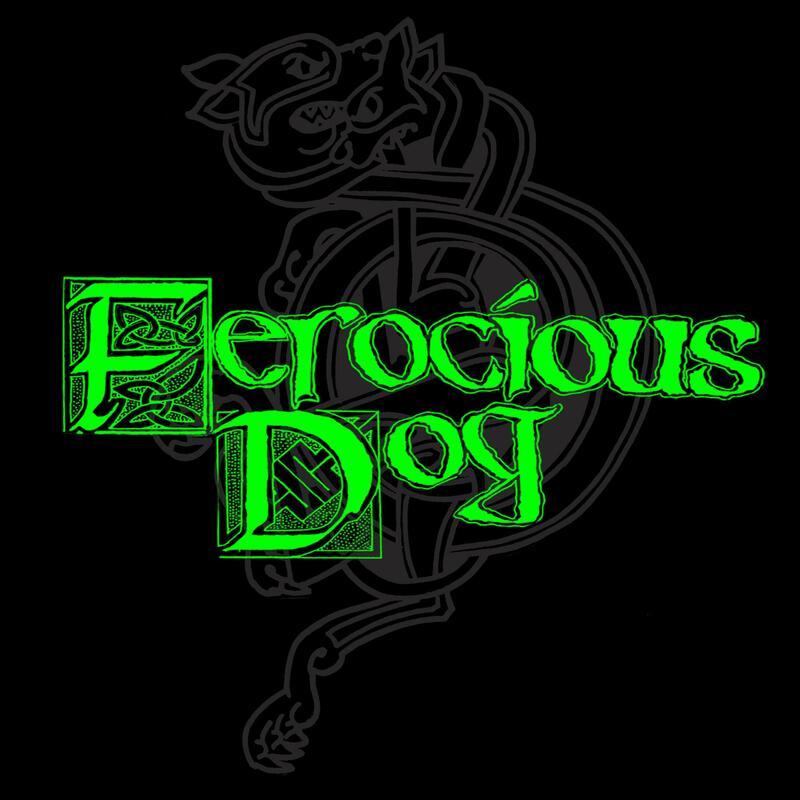 It’s not the first time Ferocious Dog have appeared at the festival but this time at a much more conducive time of the day. And the devil sends his ale hounds for me, boys..
Martin Gormley posted in the Ferocious Dog Facebook group earlier confessing to a mis-heard lyric situation – we’ve all been there. In his case it was the very name of the song that featured in the error though! In Hell Hounds rather than “And the devil sends his hell hounds for me boys” he was merrily singing along “And the devil sends his ale hounds for me boys” – which if you listen to it could be understandable given Ken’s accent (and if you go to the trouble to forget what the song is called!). It got me thinking of my own mishearing of Ferocious Dog songs – indeed, Hell Hounds was my the source favourite one – in the line “Tonight I lay with a buxom whore in a brothel drenched in beer” I had somehow conspired to hear it as “Tonight I lie with a buxom whore on the bonnet of an HGV” – have a listen, tell me I’m wrong! The mental image it’s evoked tickled me so much I got my sketch book out. I apologise unreservedly to Kenny for my awful caricature skills! 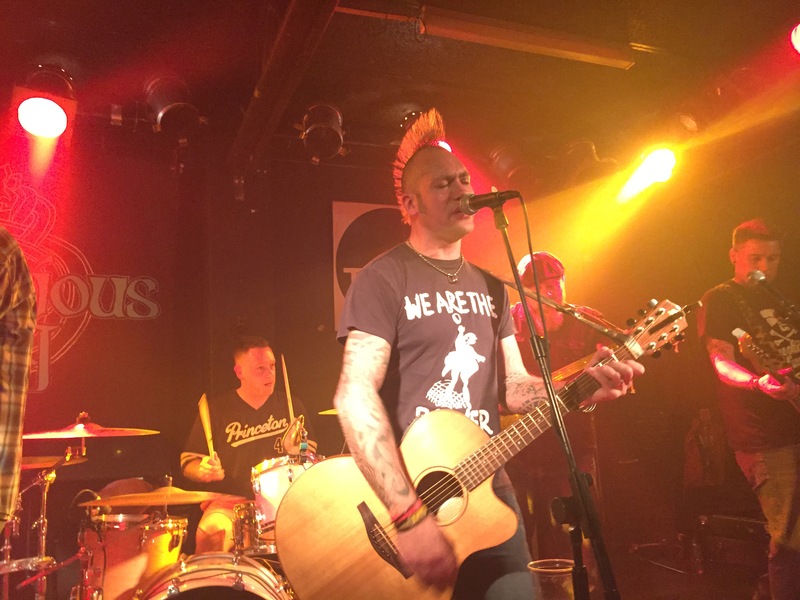 There’s no substitution for a full on Ferocious Dog gig, it’s true – however, there’s something quite magical about hearing their songs stripped back to their acoustic foundations too. At one time that would happen when songs were being written or kicked about and sometimes we were lucky enough to have them appear on YouTube (I’ve chosen Ken performing a beautiful rendition of Unconditional, but equally you could pick Dan’s preview of Lyla that he teased us with before the band worked their magic on it). Nuneaton in pictures, and a lovely cover version..
One of the few drawbacks to the Barnsley gig was that Waggy wasn’t there to dispense famous Waggy hugs and share in our laughs – and of course to take photographs – but he was at Nuneaton on Friday and took a raft of awesome photos of both Leatherat and Ferocious Dog which you can find on Facebook – or in a quick video summary below set to Raggle Taggle Gypsy and Freeborn John. Another day, another chance to discover a new venue for a Ferocious Dog gig! Barnsley Rock and Blues sits near the hospital in Barnsley and comprises a friendly bar with a hidden gem of a venue room at the back – something Andy and I rather spoiled the surprise of by arriving early and inadvertently going in via the back way, but never mind, huh? It was a good chance for Andy to catch the end of the egg-chasing and to watch the end of the Burnley vs Man City match along with Dan and Ken. Anyone local should pop back tomorrow (well, later today now) to check out the Star Botherers.